Since this year’s holiday vacation drive to Michigan via the US route is around 13 hours, this gave us a good excuse to break the drive up into two pieces, with a night in Buffalo. I rather like Buffalo as a food destination, since while it’s not exactly known for haute cuisine, it does have quite a few interesting regional specialties that I rather like. One good example is the beef-on-weck sandwich, one of my favorite variations of the roast beef sandwich (and you can read about one such beef-on-weck joint with my review of Charlie the Butcher’s). Another is Buffalo-style hot dogs, with Ted’s Hot Dogs being one of my favorite hot dog joints (although I usually visit their location located in the far, far distant suburb of Tempe, AZ). And, probably most famously, Buffalo is home of the Buffalo wing, with the Anchor Bar and Duff’s being two of the more-regaled places to get wings. Well, our stopover in Buffalo gave us another opportunity to check out Duff’s (the last two times I tried to go we got there after closing). Even better, my friend Allie from DC was in town as well (she’s been on many a food outing with me in DC, including a trip to Ben’s Chili Bowl), so we met up with her and her parents for some wings. 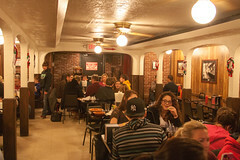 Duff’s is basically a dive bar that makes most of it’s money off of wings and food, but it still retains some of the dive bar ambiance (which, quite frankly, I think is part of the wing experience). 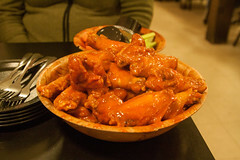 Luckily, despite arriving in Buffalo on a Friday night, we were enough ahead of the dinner rush that Allie’s family was able to score (and hold) a table for us, and we soon found ourselves with beers, carrots, celery, and two big bowls of wings (one medium, one hot for me and Carol). So, that brings us to the main question: how were the wings? I actually really like the wings at Duff’s. First of all, they still emphasize the basic Buffalo-style wing sauces, with only minimal attention paid to some of the variations that happen at most wing places, like honey-mustard wings and teriyaki wings. Second, these are real, substantial wings. No wimpy miniature wings, or, God help us, “boneless wings” here. And the heat level is quite good, with their hot actually being decently hot (although all their signs about “medium is hot, and hot is really, really hot” are obviously geared towards the tourists, since even my ‘hot’ wings were only “reasonably hot” by my Arizona-calibrated tongue), with enough options like superhot and death for those really looking for a fiery experience. And the sauces coat the wings rather well. My only downside is that compared with some other places that I like to get wings, Duff’s actually cooks theirs a bit on the soft side: I like my wings really, really crispy, so that when I’m downing wing #20 of my order it still has some semblance of the crunch that wing #1 did. Like my previous visit to Duff’s, I found myself reminding myself to order them extra crispy next time. Maybe next time I’ll actually remember that. But overall, it’s still one of my favorite places for wings, and I still enjoyed this visit. Decent beer, good wings, and good company made for a good evening overall.